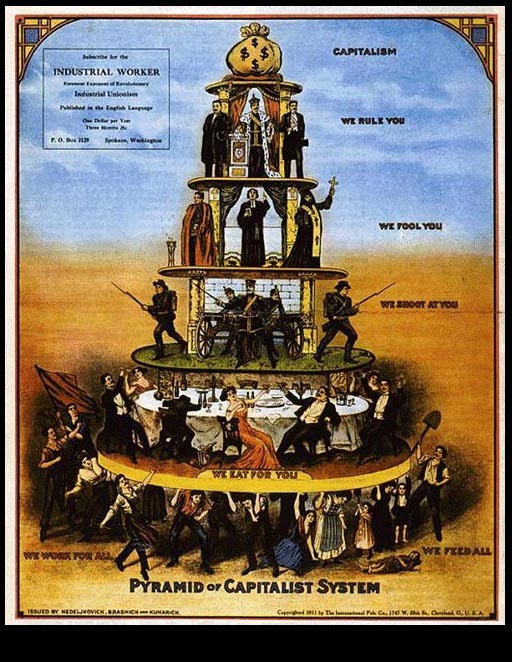 "Pyramid of Capitalist System", issued by Nedeljkovich, Brashick and Kuharich, Cleveland: The International Publishing Co., 1911. The Pyramid of Capitalist System is a provocative illustration of the hierarchical system of capitalist rule in America. In this beautifully colored portrait, the artist depicts the multiple tiers of working class oppression. At the top of the pyramid sits the state, which serves the interests of the ruling class and functions under capitalism as the protector of private wealth and property. Below the state stand the religious leaders, clergymen, and preachers of false consciousness who encourage obedience to and acceptance of the status quo, entreating the working masses to accept their ordained fate and seek their just rewards not on earth but in that glorious hereafter. If obedience cannot be encouraged it will surely be enforced by the members of the next tier. As events in Homestead and Pullman clearly testified, the police and militia had as their objective not the protection of "the people," but rather the protection of capital from "the people." Beneath the military sit the parasite class, the bourgeoisie, who exploit the toilers of the world and profit by their labor power. Beneath it all, bearing the weight of the entire system, are the workers who produce all things fundamental to the perpetuation of life and the continuation of this system. Thus, in addition to illustrating the multi-layered oppression and exploitation of workers, this image also begs the question, "what would happen to capitalism if the workers simply withdrew their support?" See also the 1920s cartoons "The Blind Man's Share" and Organize and Take the Big Bag.